Pr Gilles Grateau,Department of Internal Medicine, Hospital Tenon. Autoinflammatory diseases are caused by an anomaly in the innate immune system which normally allows us to respond very rapidly to an environmental challenge. Hereditary recurrent fevers are considered as the prototype, manifesting very early in life by attacks of fever of variable duration, accompanied by other symptoms relating to digestion (abdominal pain), articulation (pain and swelling of joints), skin (diverse eruptions) and eyes (eyes occasionally red, problems relating to vision). Depending on the frequency and severity of attacks, the functional repercussions can be highly detrimental. In addition they can also be associated with other serious diseases such as amyloidosis leading to renal insufficiency. The most wisely recognised and most frequently occurring disease is Familial Mediterranean fever (FMF) or periodic disease which particularly affects certain populations (Sephardic Jews, Armenians, Maghrebi, Turks). Other much rarer diseases include the cryopyrin-associated periodic syndromes (CAPS) [which group together Familial cold urticaria, Muckle-Wells syndrome, and CINCA syndrome], the periodic TNF receptor deficiency syndrome (TRAPS), the partial (hyper-IgD syndrome) and complete (mevalonic aciduria) deficiency in mevalonate kinase (MKD), BLAU syndrome (familial granulomatous arthritis), PAPA syndrome (pyogenic arthritis, pyoderma gangrenosum and acne) and Majeed syndrome (chronic recurrent multifocal osteomyelitis). Other clinically related yet less clearly hereditary diseases are also classed as autoinflammatory diseases. In particular, these include Behçet’s disease, PFAPA syndrome (Juvenile idiopathic arthritis). Recognising this group of diseases requires a certain clinical expertise alongside a specialist and reliable genetics laboratory. Management of these patients implicates a multidisciplinary team and often the implementation of innovative treatments undergoing therapeutic trial. Pr Koné Paut and Dr V Hentgen, both paediatric rheumatologists, have experience treating numerous children affected by auto-inflammatory diseases. 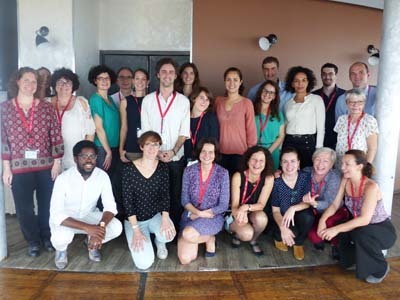 Practitioners from within our reference and research centre participate towards or themselves manage a number of research and evaluation networks at both national and European levels. The health minister has approved the autoinflammatory disease unit run by Pr Touitou for the molecular diagnosis of these diseases. This unit has initiated an international control of the quality of diagnostic methods used for diagnosing this group of diseases and has created an online registry of mutations (Infevers). Pediatric, multidisciplinary and transitional consultations on autoinflammatory diseases are also proposed.